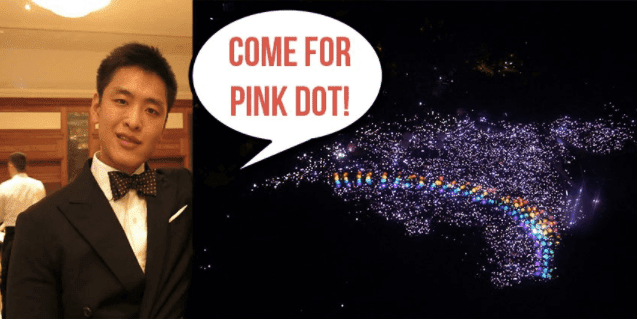 Thousands of Singaporeans flocked to Hong Lim Park on Saturday (July 1), as the much-anticipated Pink Dot was held after overcoming many obstacles. Among them: Foreign sponsorship was banned, which led to local companies filling in the gap; foreigners were banned entirely, leading to barricades being erected around the park; and people complained over even the event’s ad at Orchard Cineleisure. In happier news, however, Paralympian Theresa Goh came out and became a Pink Dot ambassador. Here she is at the event. Executors and trustees of Mr Lee Kuan Yew's estate, Lee Wei Ling and Lee Hsien Yang, have made a Deed of Gift of some furniture and personal effects from 38 Oxley Road, the home of Singapore's founding Prime Minister, to the people of the Republic. The announcement was made in a news release by Stamford Law, on behalf of the daughter and son of the late Mr Lee on Thursday (Jun 11). The deed was signed with the National Heritage Board (NHB) on Monday. 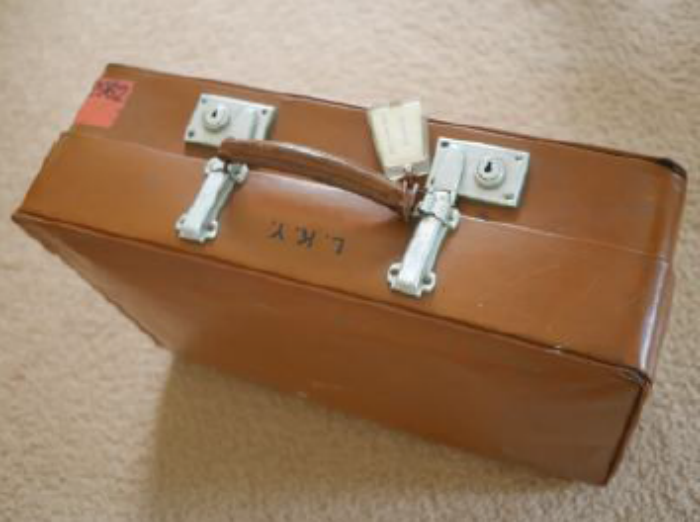 The items include all the furniture from the dining room, the study room, and work area desks, including the desk he worked on for many years, as well as his clothing worn on a number of historic occasions. 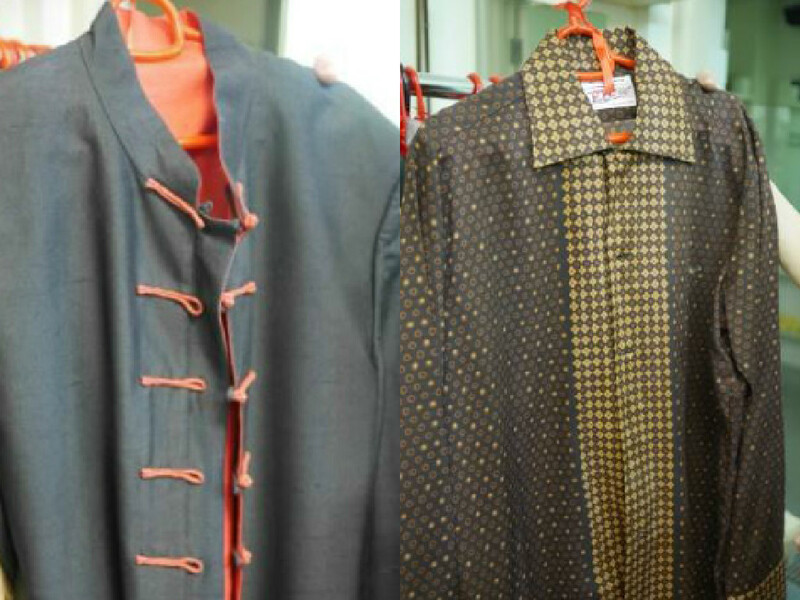 They have already been turned over to NHB in preparation for a planned major public exhibition at the SG50 Tribute Gallery in August or September, the news release said. Wax figures of former prime minister Lee Kuan Yew and his late wife Kwa Geok Choo have been unveiled at the Madame Tussauds Singapore wax museum, which had its grand opening on Thursday. The figures show Mr and Mrs Lee smiling, arm-in-arm and seated against a backdrop of red flowers formed in the shape of two hearts. 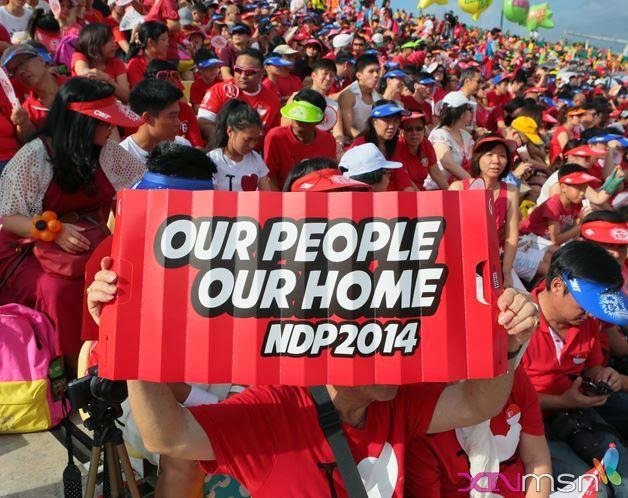 They are also dressed in the colours of Singapore's national flag - red and white. 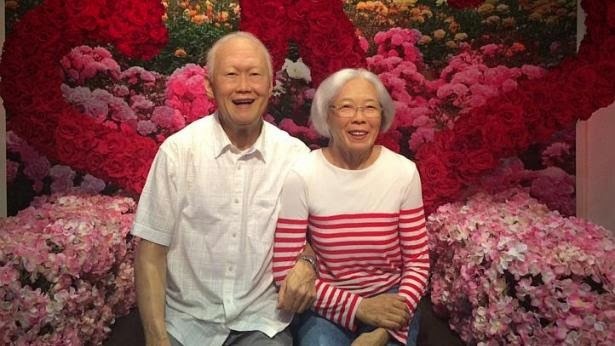 The couple's wax figures are among other lookalikes of political leaders, including Prime Minister Lee Hsien Loong and Emeritus Senior Minister Goh Chok Tong. During his visit, Mr Lee praised the team who had put up the exhibition for their "thorough research" and for "presenting this key period for today's audience", said Deputy Prime Minister Teo Chee Hean. 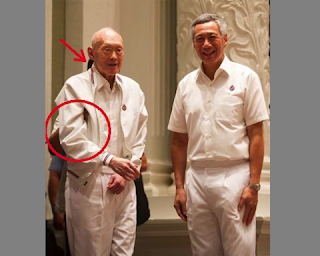 Mr Teo posted a picture of Mr Lee's visit on Facebook on Thursday morning, adding that "winning the struggle against the communists paved the way for modern non- communist Singapore". 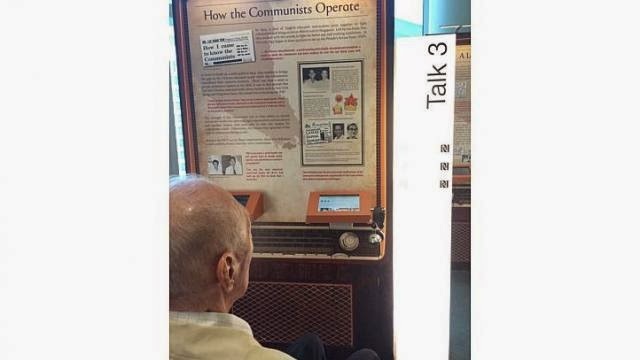 The exhibition is in conjunction with the reprint of The Battle For Merger book, which compiles Mr Lee's radio talks for a younger generation of Singaporeans. Mr Lee's talks had exposed the communist threat in Singapore in the 1960s and the goal of the communists to capture power in the country. IT WAS a tumultuous time, with the Communist Party of Malaya (CPM) and its allies out to derail self-governing Singapore's plans for merger with Malaya. 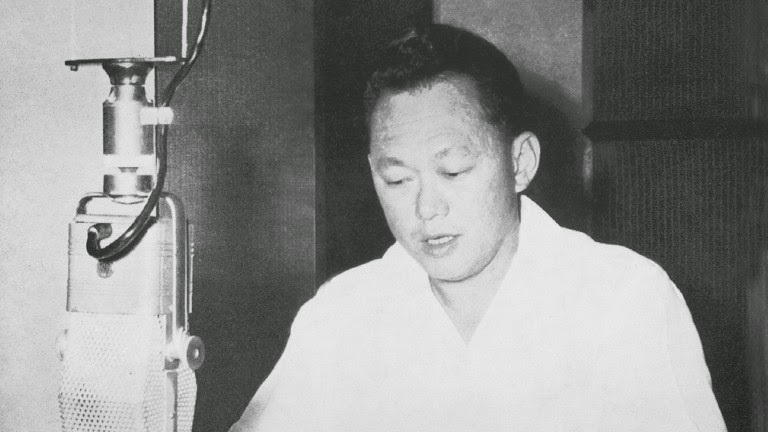 Taking to the airwaves in 1961 for 12 radio broadcasts to expose the CPM's real agenda to seize power, then Prime Minister Lee Kuan Yew managed to turn the tide. A compilation of the talks, first published in 1962, has been reprinted. 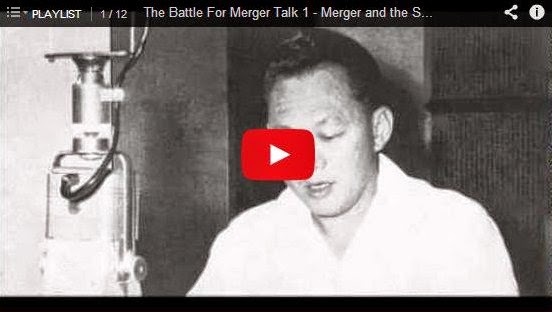 The Battle For Merger was launched yesterday, on the same date as Mr Lee's last broadcast 53 years ago. 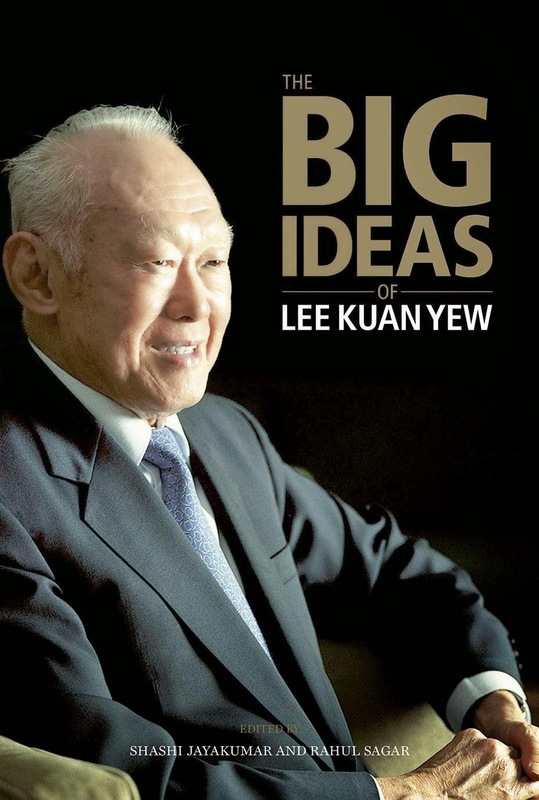 A new book, The Big Ideas Of Lee Kuan Yew, was launched yesterday. Below are excerpts from three essays in the book by former ambassador Chan Heng Chee, former permanent secretary of foreign affairs Bilahari Kausikan, and Permanent Secretary (Public Service Division) Yong Ying-I. The book is based on a conference in September last year organised by the Lee Kuan Yew School of Public Policy, National University of Singapore. 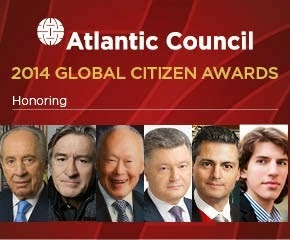 AMERICAN dignitaries and global figures paid tribute to former Singapore prime minister Lee Kuan Yew in New York on Sunday, when he became the first Singaporean to receive the Atlantic Council's Global Citizen Award. 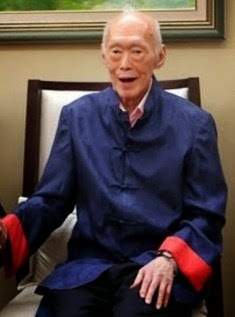 At a ceremony, the likes of former United States secretary of state Henry Kissinger and former US envoy to Singapore Jon Huntsman hailed Mr Lee as one of the world's foremost statesmen. Dr Kissinger, who gave the opening remarks at the event, described Mr Lee as "one of the great men of our time" and noted that his forceful streak had been evident decades ago. 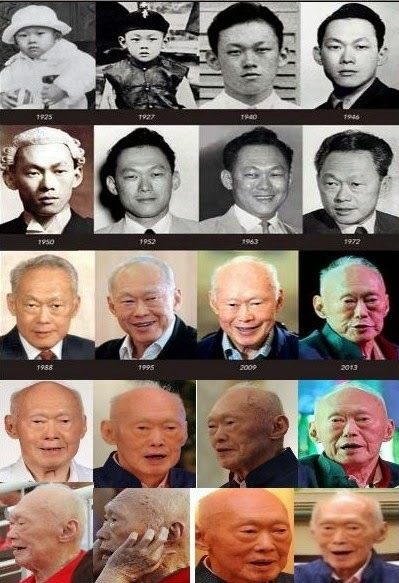 Lee Kuan Yew was born in Singapore in 1923. He was educated at Raffles College, Singapore and Fitzwilliam College, Cambridge, England. He was called to the Bar at Middle Temple in London in 1950 and practised law in Singapore. He was an adviser of several trade unions. In 1954, he was a founder of the People's Action Party and was secretary general until 1992. 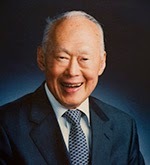 In 1959, he became prime minister of Singapore and served successive terms until he resigned in November 1990, when he was appointed senior minister by Prime Minister Goh Chok Tong. He was reappointed after the 1991, 1997 and 2001 general elections. He was appointed minister mentor by Prime Minister Lee Hsien Loong in August 2004, and was reappointed after the 2006 general elections. He stepped down as in May 2011, and is currently senior advisor to the GIC Private Limited. 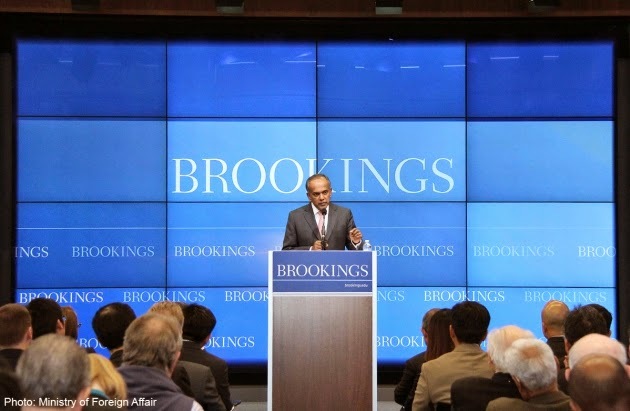 The Brookings Institution has launched a new academic position named after former Prime Minister Lee Kuan Yew, as the Washington-based think-tank seeks to raise awareness of South-east Asian issues in the United States capital. The wraps were taken off the "Lee Kuan Yew chair in South-east Asia Studies" on Friday night in a ceremony at the Fullerton Hotel. The position, funded with an initial US$3 million (S$3.7 million), will be rotated among academics chosen from the different ASEAN countries, starting with Singapore. The plan is for each academic to have a two-year tenure. The Lee Kuan Yew Chair was set up to raise awareness of South-east Asian issues in the US capital. It is one of only a handful of academic positions in Washington think-tanks that focuses on the region. The academic position is also the first time anything in the US has been named after the former prime minister. 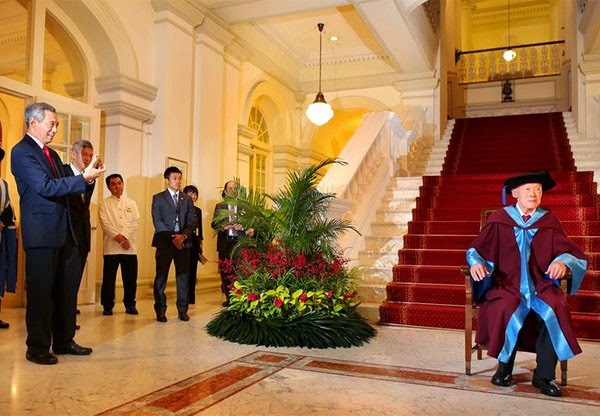 Dr Joseph Liow, associate dean of Singapore's S. Rajaratnam School of International Studies, will be the first person to take up the position that is meant to be rotated every two years among academics from South-east Asia. He said he will seek to make sure that South-east Asia has a voice in discussions in the US capital and noted that the position has a big name to live up to. "The chair is named after a truly remarkable man. While much has been said about Lee Kuan Yew's role in building the Singapore today, as a student of international politics, I have been far more interested in his contributions in matters of foreign affairs. In this area, I have found his reading and articulation of international developments from a South- east Asian perspective and its implication not only for Singapore, but (also for) the region and the world, truly unmatched." 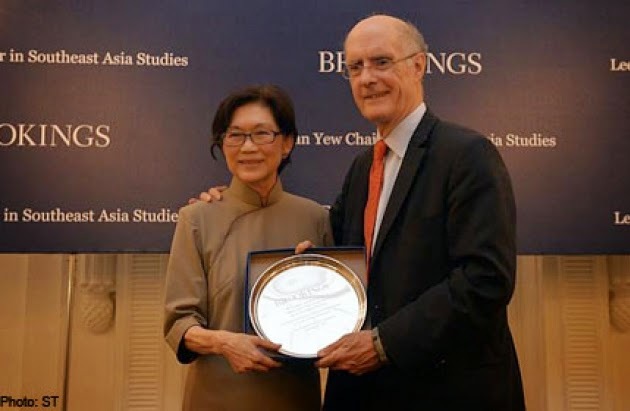 Dear Ms Susan Rice, I refer to your 22 Sept 2014 remarks at Brookings Institution’s formal announcement of the creation of the Lee Kuan Yew Chair for Southeast Asian Studies. it’s fitting that Brookings’ new Chair in Southeast Asian Studies is named for Singapore’s founding father, a man who has played such a key role in shaping the region’s growth, Lee Kuan Yew. Singapore’s founding father is not Lee Kuan Yew. Singapore was founded in 1819 by Sir Stamford Raffles. There has been no re-founding of Singapore ever since. Lee Kuan Yew studied at a school named after Raffles. In Lee Kuan Yew’s own words, Singapore was already ¾ independent in 1959 when he came to power. That ¾ independence wasn’t won by Lee Kuan Yew but won by Singapore’s independence fighters who were generally regarded as the Leftists, Lee’s most hated enemies. IN PARLIAMENT TODAY: On 3 June 1959, a momentous event occurred at City Hall. Yet, despite the historic impact that the day will make there was no photographic record. No pressmen or photographers were allowed. On that day, Mr Lee Kuan Yew was sworn in as Prime Minister of the State of Singapore, signaling that Singapore was now self-governing. He and our early pioneers weathered the storm with fellow Singaporeans, creating a dynamic and developed nation in a short 50 years. This afternoon at our tea break, the conversation at our table fell into a respectful silence for a moment. With my back to the door, I had not seen Mr Lee enter the Members' Room. We all stood up and made space for him. He insisted on getting up from his wheelchair and to sit with us and just have a drink. While he looks much thinner and gaunt and halting though his speech, the conversation we had over the next 15 minutes reveal the continued sharpness of his mind and the wisdom and counsel of his years. I walked behind him as he entered the chamber, and was reminded of the painting by Dr Lai Kui Fang which hangs outside the Parliament Library, a recreation from interviews and memories of that moment in 1959, when Mr Lee and his comrades led Singapore to self-government, and how the now slightly frail gentleman is a giant of our nation. 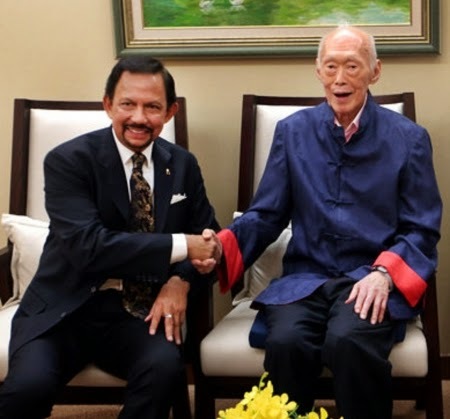 Recently, state broadcaster Channel NewsAsia tweeted this photo of former Singapore prime minister Lee Kuan Yew, courtesy of the Ministry of Communication and Information. 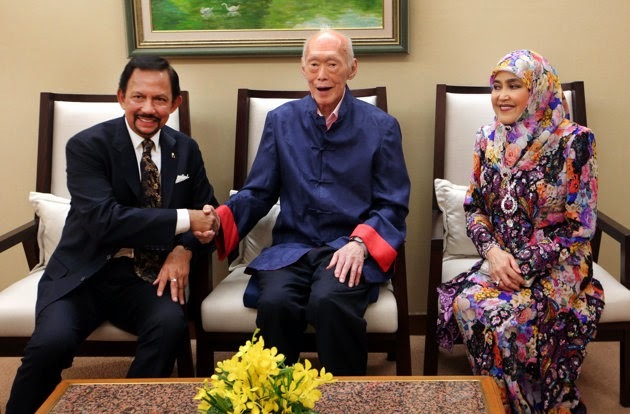 It shows Sultan of Brunei Haji Hassanal Bolkiah and his wife the Raja Isteri Pengiran Anak Hajah Saleha flanking Lee at the Istana on 21st April 2014 during the Brunei leader’s state visit to Singapore. People on social media quickly started expressing their concern over how emaciated the former prime minister looked. CNA sets off unintentional waves in cyberspace, no followup yet from the MSM. Perhaps the government shared the picture of him to reassure us that he's still doing okay. 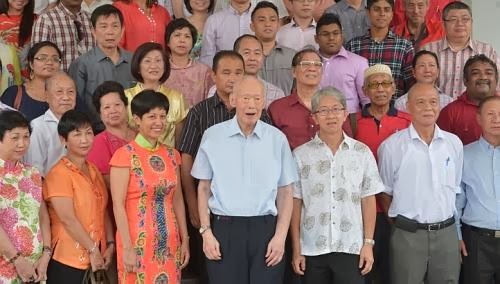 Former prime minister Lee Kuan Yew attended an annual Chinese New Year party for grassroots leaders at the Istana on Sunday evening. The Chinese New Year garden party was hosted by Prime Minister Lee Hsien Loong and Cabinet ministers. It was the elder Mr Lee’s first public appearance since he attended two days of Parliament sittings last month. Last Tuesday, Mr Lee, 90, was due to speak at an annual Chinese New Year dinner in his Tanjong Pagar GRC but could not attend due to ill health. President of the Russian Federation, Vladimir Putin, has conferred the Order of Honour on Singapore's former Minister Mentor Lee Kuan Yew. Mr Lee was honoured on 10 September 2013 for his substantial contribution to strengthening friendship and cooperation with the Russian Federation and development of scientific and cultural relations. The award was also conferred in conjunction with Mr Lee's 90th birthday in 2013. Why is LKY absent at birthday dinner in his honour? 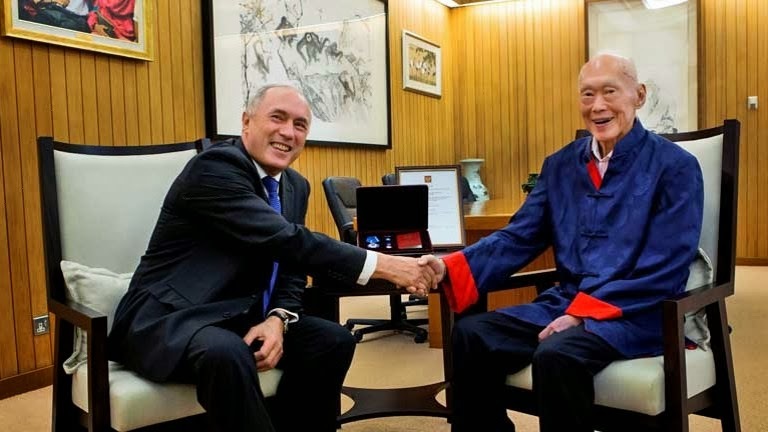 3 Chinese community organisations – the Singapore Federation of Chinese Clan Associations (SFCCA), the Singapore Chinese Chamber of Commerce and Industry, and Business China, presented the Business China Lifetime Achievement Award to Mr Lee Kuan Yew yesterday (5 Sep) to honour him. The award was also presented in celebration of his upcoming 90th birthday on 16 September. However, he was not present to receive the award. He despatched his second son, Lee Hsien Yang, to receive the award on his behalf. His elder son, PM Lee Hsien Loong, is away in Russia for the G20 Summit. 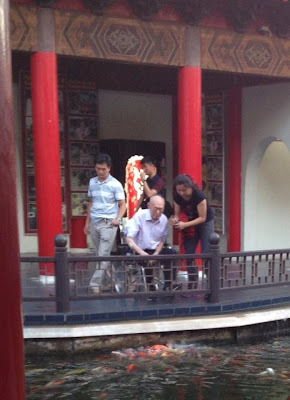 Some one snapped this at Chinese Garden yest 25-Aug 2013. No one has ever seen Ah Gong in wheelchair before in public. The Singapore University of Technology and Design is now home to a bronze bust of former Minister Mentor Lee Kuan Yew. It is a gift from the Lyon-Singapore Association and the Municipality of Lyon. The sculpture, weighing about 80 kilogrammes, was unveiled at the Lee Kuan Yew Centre for Innovative Cities in the Singapore University of Technology and Design on Tuesday. 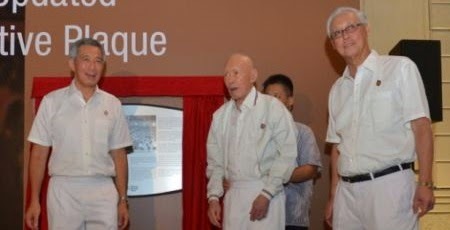 The Lyon-Singapore Association and the Municipality of Lyon yesterday presented a gift to the Republic of a bronze bust of former Minister Mentor Lee Kuan Yew. The gesture was a tribute to Mr Lee’s outstanding accomplishments in Singapore and the world as well as ‘a token of the friendship between the French and the Singaporean people’, Lyon-Singapore Association President Alain Labat said. Weighing 80kg and measuring 90cm in height, the bronze bust was sculpted by French artist-sculptor Nacera Kainou over six months. Which democratic leader has an image of himself immortalized in the form of a statue or bust while he's still alive? With the exception of the likes of Wilson Nelson Mandela , who's been immortalized in such form for his fight for freedom rather than holding political office, the rest are dictators, tyrants and fascists. Looks like between the democratic leader and the fascist, Lee fits the latter. Idol worshipper French artist-sculptor Nacera Kainou kissing the bust of LKY. Make no mistake. She's not showing her admiration for the living fascist. She's just being narcissistic, loving her own sculptured work. 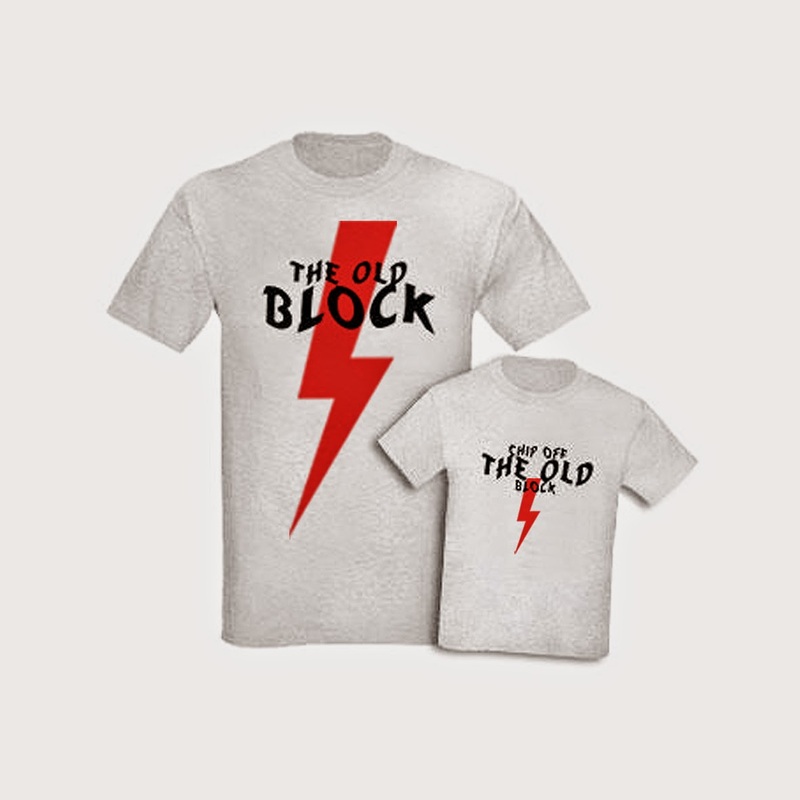 Image taken from here. By precedence, there are three ways a political leader gets such honour where his image is immortalized in such manner. What do politician Lee Kuan Yew and artist Andy Warhol have in common? Quite a number of things. Both are famous men born in the 1920s and both founded something - Mr Lee founded modern, independent Singapore in 1965, while Warhol founded the pop art movement in the 1960s. 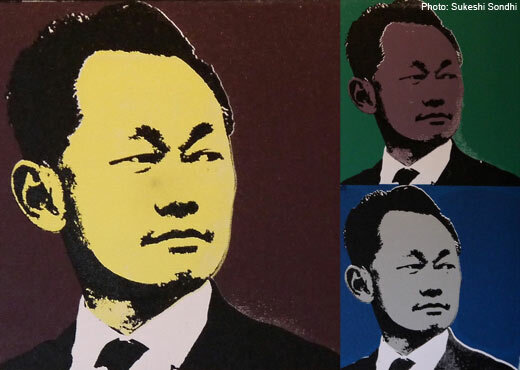 Perhaps, it is apt then that artist Sukeshi Sondhi has chosen to render Mr Lee in distinctly Warholian pop art style for her upcoming solo exhibition of some 20 paintings. Using an image of Mr Lee from the 1960s when he was a young man, she depicts him in various bright colours, repeating the same image across all her canvases. 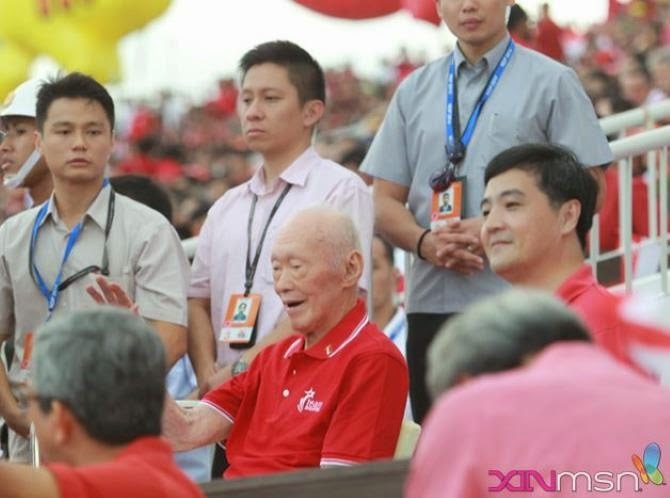 ALTHOUGH he was feeling unwell, former prime minister Lee Kuan Yew yesterday continued his perfect record of turning up at every National Day dinner of his Tanjong Pagar ward. Mr Lee, who turns 90 next month, was feeling weak yesterday but refused to miss the dinner with his residents. While there, he then went through the entire planned programme, which included delivering a 10-minute speech. Former Minister Mentor Lee Kuan Yew has urged parents to start inculcating bilingualism in their children early. A long time advocate of bilingualism, Mr Lee said psychologists in the US have found that one can teach a 2 or 3 year-old child multiple languages, and it will not confuse him or her. Former Minister Mentor Lee Kuan Yew has urged parents in Singapore to introduce bilingualism to their children at an early age. 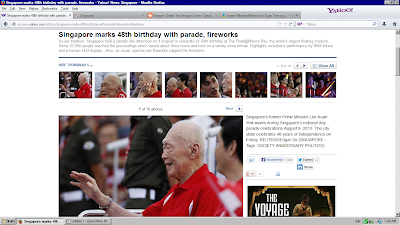 Mr Lee, 89, was not feeling well yesterday, but showed up to celebrate the occasion with about 900 residents. The Tanjong Pagar Member of Parliament (MP) and former Prime Minister waved to the audience and drew rapturous applause as he walked slowly onto the stage. It is strange that Mr Lee is now telling Singapore parents not to place too much emphasis on their children’s academic results. 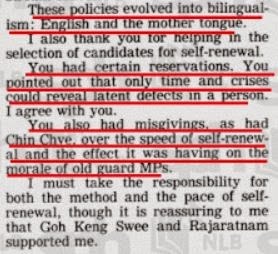 In a newspaper article by The Straits Times on 20 Dec 1984, it was reported that Mr Lee himself went ahead to compare the ‘O’-level results of former opposition MP Chiam See Tong with those of former Minister Mah Bow Tan. Mah was a President Scholar who used to “ace” his exams. Both were candidates for the Potong Pasir ward in the 1984 general election. Mr Lee, then Prime Minister of Singapore, told Singaporeans that they might be disappointed when opposition members got into Parliament. Lee Kuan Yew's views obsolete, or the truth hurts? ‘His view somewhat represents the Mahathir generation ... always looking at the dichotomy between rights and race, black and white,' says the PKR de facto leader. Anwar Ibrahim should not not brush aside former Singapore PM Lee Kuan Yew's views on Malaysia and its race based politics. This is perhaps his last book, and he had "let it all out" his thoughts and feelings about Singapore, Malaysia, Asean, China, USA and the rest of the world. If you read between the lines, he wants Malaysia to succeed. He's a 90-year-old man. We (should) give allowance to him, (just) like people who give allowance to me. Former prime minister Tun Dr Mahathir Mohamad, 88, said this when asked to comment on former Singapore premier Lee Kuan Yew's latest book, One Mans View of The World, which was launched on Tuesday. 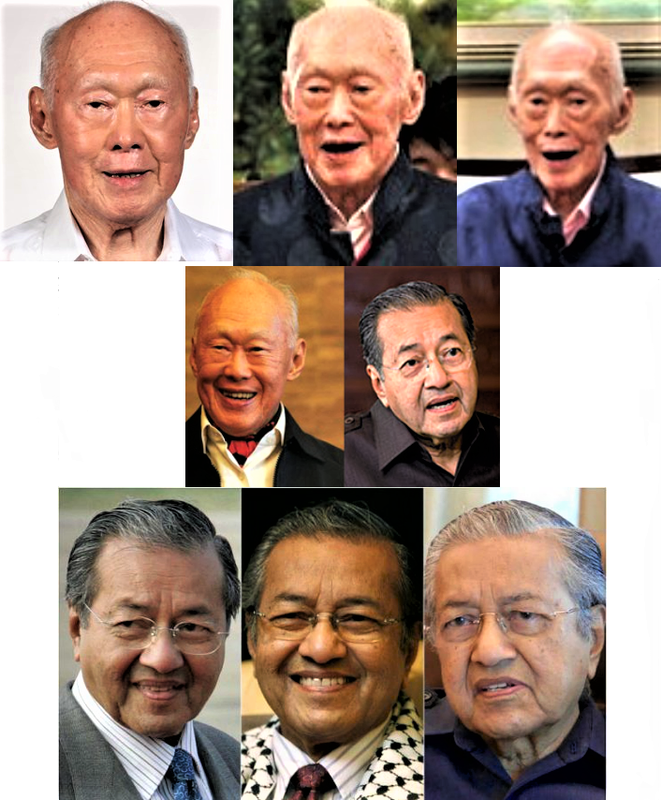 Among others, the book quoted Lee as saying: Malaysias race-based politics placed the country at a disadvantage and was voluntarily shrinking the talent pool. We should not always look at the dichotomy between rights and race, black and white. "For example, he (Lee) talks about race-based policies, but there is very little understanding of the discourse in the last decade,” he said. Anwar said Lee was still "trapped in the old mindset," when he used to be in the opposition during Malaya before Singapore was established. Karpal Singh hit out at Singapore’s Lee Kuan Yew today for doubting Pakatan Rakyat’s (PR) ability to lead Malaysia, saying it was time for the elderly former prime minister to give up the reins of leadership and “quietly ride into the sunset”. Commenting on Lee’s recently released book “One Man’s Viewof the World”, the DAP chairman and Bukit Gelugor MP said Lee had every right to give his views but the Singaporean politician should first look at his own party. “His comment that Pakatan Rakyat (PR) will not effectively govern the country had it been successful in winning over federal power is without any basis,” the DAP national chairman said in a press conference here. 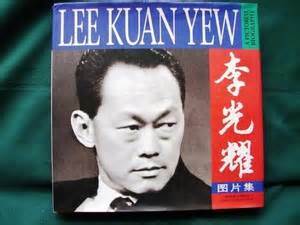 LEE Kuan Yew's (LKY) Malaysia A Different Path in his One Man's View of the World is important for a simple reason. It is a reflection of how an overwhelming majority of Chinese Malaysians and a sizeable number of Indian Malaysians feel about Malaysia. It is this feeling that expressed itself through the ballot box on May 5. 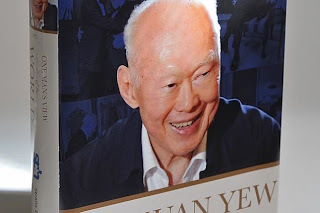 Lee Kuan Yew, Singapore's first prime minister and the father of the island republic's current prime minister Lee Hsien Loong, launched his latest book "One Man's View Of The World" yesterday. The 400-page book features conversations in Singapore last year between him and his long-time admirer, Helmut Schmidt, the former chancellor of West Germany. They discussed world affairs. Lee's comments on Malaysia were particularly scathing, not surprising given his rocky relationship with leaders on this side of the causeway. Singapore was ejected from the Malaysian federation in 1965 by Tunku Abdul Rahman, the first prime minister of Malaysia. Singapore’s first prime minister, Lee Kuan Yew, warned against the risks in helping to develop an economic zone in neighbouring Malaysia, adding that the wealthy city-state he helped build might not be around in 100 years if it did not pick good leaders. “I am absolutely sure that if Singapore gets a dumb government, we are done for,” Lee, who turns 90 next month, wrote in One Man’s View of the World, a book launched today. 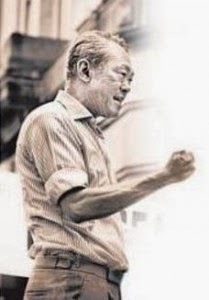 Losing none of the candour that made him one of Asia’s most influential leaders, Lee had sharp words for some of Singapore’s neighbours, in particular Malaysia, from which Singapore split in 1965, amid ethnic tension between its Malay majority and the Chinese minority. Lee Kuan Yew, the Father of Singapore and father of Prime Minister Lee Hsien Loong of Singapore has described Sri Lankan President Mahinda Rajapaksa as a Sinhalese Extremist and what happened in Sri Lanka in 2009 as ethnic cleansing. This statement of Lee is a matter with great import. All these years criticism from outside was dismissed by the Sri Lankan government as by colonialists. But this is by a respected Asian leader. After Singapore’s Senior Minister has spoken thus, will Singapore feel free to attend the Commonwealth Heads of Government Meeting (CHOGM) in November? He also described what happened in Sri Lanka in 2009, during the end of the civil war, as ethnic cleansing. The father of modern day Singapore made this statement during a conversation with author Thomas Plate, who wrote the book ‘Citizen Singapore: How to Build a Nation – Conversations with Lee Kuan Yew. Lee described Sri Lanka as an “unhappy country” as it was disunited between the Sinhalese and Jaffna Tamils for decades. Former prime minister Lee Kuan Yew's new book launched last Tuesday, One Man's View Of The World, presents what he thinks about the future of major powers and regions. In these extracts, he speaks about death and dying, a younger generation of Singaporeans who have known only a thriving Singapore, as well as Japan's ageing society and Europe's currency woes. Mr Lee: "My daily routine is set. I wake up, clear my e-mail, read the newspapers, do my exercises and have lunch. After that, I go to my office at the Istana, clear more papers and write articles or speeches. Reporting that Mr Lee “feels weaker by the day and wants a quick death”, AFP also claims that he has “visibly weakened” since his wife died in 2010 and that the loss “shattered the normally stoic veteran politician”. The Gulf Times also reports on Mr Lee’s wishes to “make a quick exit” should he reach a stage of incapacitation from which recovery is deemed unlikely. If the international media coverage on his book is any indication, whether you agree or disagree with the man, or love or hate him, when Mr Lee Kuan Yew speaks, the world takes notice. Singapore's founding father Lee Kuan Yew, who will turn 90 next month, said in a new book that he feels weaker by the day and wants death "to come as quickly and painlessly as possible." The book is dedicated to the Asian statesman's views on international affairs but an entire chapter contains his musings on death, religion and other personal issues. “There is an end to everything and I want mine to come as quickly and painlessly as possible, not with me incapacitated, half in coma in bed and with a tube going into my nostrils and down to my stomach,” he wrote. On his fears for the future of Singapore, Lee, who once famously vowed to rise from his grave if something went wrong with the country, now seems ready to let fate run its course. 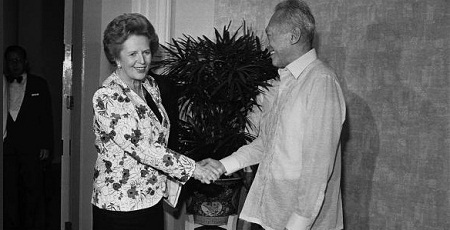 Lee Kuan Yew has praised President Xi Jinping as a man of "great breadth", comparing him to Nelson Mandela. The high praise from Lee, Singapore's founding father who turns 90 next month, comes from his new book, One Man's View of the World, which was launched yesterday. He appeared alert but frail at the launch and did not take questions. Lee is widely credited with building Singapore into one of the world's wealthiest nations with a strong, pervasive role for the state and little patience for dissent. His influence extended beyond the tiny population of 5.3 million, as the city state's economic success served as a model for many developing countries, including China under Deng Xiaoping , and he still garners respect from global leaders. On Aug 22, 2012, I received a thank-you card from a Singaporean by the name of James Ow-Yeong Keen Hoy. From his elegant, cursive handwriting, I guess he must at least be in his 50s. Young people these days prefer to type, and when they do write, they simply do not write as beautifully. He wrote: "My family is deeply grateful and has benefited from your magnificent leadership and solid contributions that have enabled our nation to achieve peace, happiness, progress, prosperity, solidarity and security all these good years. A big thank you! Singapore former Minister Mentor Lee Kuan Yew said a country that does not grow its population risks dissolving "into nothingness". Mr Lee was speaking at a wide-ranging dialogue session organised by Standard Chartered Bank on Wednesday evening. Joining Mr Lee for the dialogue was former chairman of the US Federal Reserve and former chairman of US President Obama's Economic Recovery Advisory Board, Paul Volcker. This was the first time Mr Lee was speaking about Singapore's changing demographics since the Population White Paper was endorsed in Parliament. Jeremy Grant, a journalist from the Financial Times, was invited to the Istana for the press conference of Mr Lee Kuan Yew’s latest book launch on 6 August last week. A team from The Straits Times provided research and editorial material, and conducted a series of interviews with Mr Lee. Excerpts of these interviews are included in each chapter. The team included Han Fook Kwang, Zuraidah Ibrahim, Chua Mui Hoong and Elgin Toh. Straits Times Press, the book publishing unit of Singapore Press Holdings (SPH), announced today the launch of Mr Lee Kuan Yew's new book. Titled One Man's View of the World by Lee Kuan Yew, the 400-page volume conveys Mr Lee's views on the future of the major powers and regions of the world. The book is made up of 11 chapters. The first seven cover countries or regions: China, the United States, Europe, other Asian powers (Japan, India and Korea), South-east Asia, Singapore and the Middle East. Former prime minister Lee Kuan Yew planted a rain tree at Holland Village Park on Sunday, continuing a what has become an unbroken 50-year tradition. On the same day in 1963, Mr Lee planted a mempat tree at Farrer Circus, then a traffic roundabout, to signify the start of an island-wide tree-planting campaign. A collection of former Minister Mentor Lee Kuan Yew's speeches, interviews and dialogues was launched today at a ceremony held at The Fullerton Hotel. "The Papers of Lee Kuan Yew: Speeches, Interviews and Dialogues (1950 - 1990)" is a four-decade collection from the National Archives of Singapore (NAS). Former prime minister Lee Kuan Yew gave a speech at the launch of a collection of his dialogues, interviews and speeches yesterday. The speeches cover a broad spectrum of topics including my positions on colonialism, self-governance, politics, social and economic policies. It's telling that a Malaysian and not a Singapore newspaper noted Singapore's Minister Mentor Lee Kuan Yew completed 50 years in office, becoming the world's longest surviving national leader, on June 5. 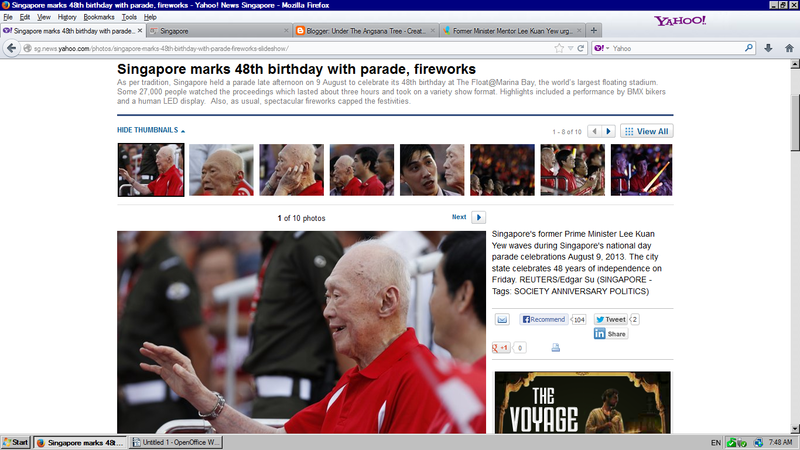 It was on that day 50 years ago he was sworn in as the first prime minister of a self-governing Singapore. 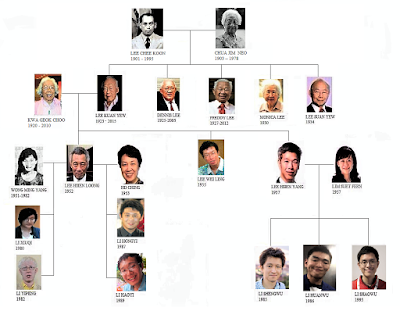 He was succeeded in 1990 by his deputy, Goh Chok Tong, who in 2004 handed over power to Mr Lee's son – current Prime Minister Lee Hsien Loong. Singapore has never known a day since the end of British rule when it has not been under the firm and capable leadership of Mr Lee and his People's Action Party. He has led the tiny city state of 4.8 million people to prosperity. From Third World To First is the title of the second volume of his memoirs. So why is the image-conscious government so reticent about Lee’s political longevity? Critics, however, give a different reason. One said the government would rather not mention the subject for fear it would renew calls for him to leave. It is the younger Singaporeans who want him to go. Unlike the previous generation, they are not beholden to him for his contributions to the republic. One woman, a middle-aged professional, got nods of agreement when she said modern Singapore's founding father, Lee Kuan Yew, had done great things but that new ways were needed from current leaders still practising a "do-as-I-say style of parenting"
Singapore remains regimented but the unusually frank criticism at the recent gathering, part of a government-run national "conversation" about the city state's future, reflects the reality that this is no longer the era of Lee Kuan Yew. 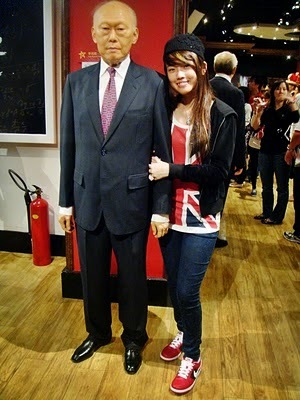 Singapore is more than one man, however great he was. Was. Recently he was seen in a wheelchair. The guy is...what's that word, errr, old. What do you expect, this mortal coil that affect all great and small. 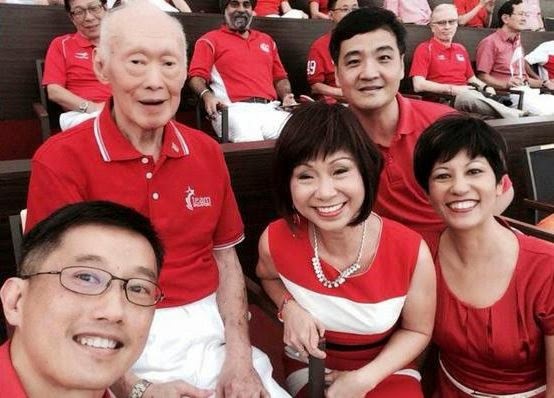 This cult of Lee does more harm than good to the Singaporean psyche of little red dot punching beyond its weight. You mean we can't go on without him? Yes we can. To think we cannot disrespects the former PM. Respect him, but not deify dear Harry. FFS. Imagine this, he is not even dead yet and there is so much fanfare about his birthdays and books. Why the hell is his birthday news BTW? If 16 September is anything to remember for, it should be Malaysia Day, when Singapore joined the Federation and it sealed Singapore's fate and separation from Malaysia 2 years later in 1965. Not the old guy's birthday, tremendous respect though I have for him. – Loh and Behold: Poor Fella Is Not Dead Yet Lah! Yes! That is the look that I was talking about. It is sad to witness the deterioration of a once powerful man. As per tradition, Singapore held a parade late afternoon on 9 August to celebrate its 48th birthday at The Float@Marina Bay, the world’s largest floating stadium. Some 27,000 people watched the proceedings which lasted about three hours and took on a variety show format. Highlights included a performance by BMX bikers and a human LED display. Also, as usual, spectacular fireworks capped the festivities. 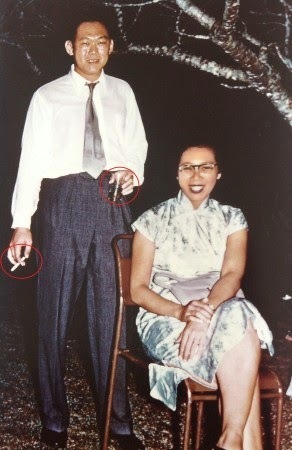 Here's wishing Mr Lee Kuan Yew a Happy 91st Birthday! The letters were published in ST on 29 & 30/12/84. 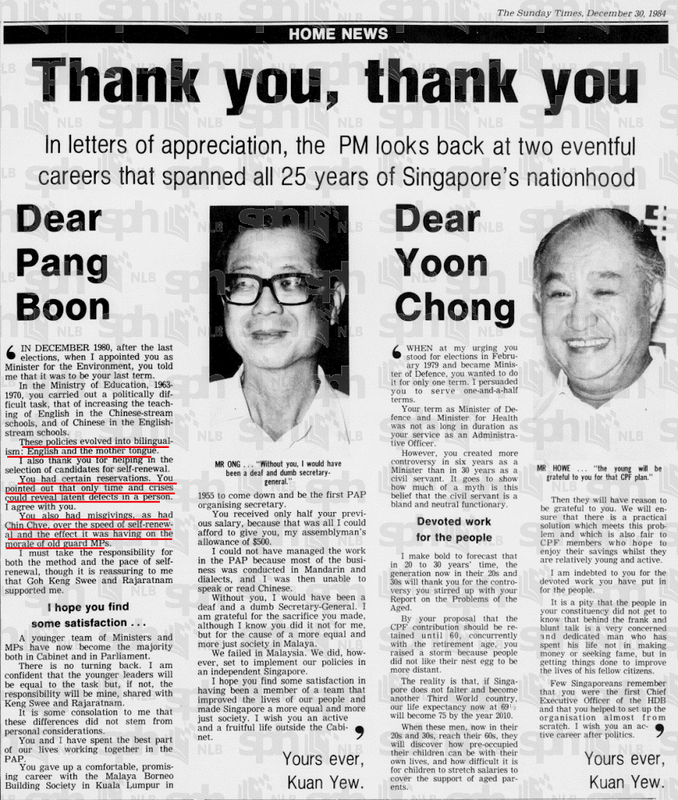 This was the period when 24 old guards stepped down for the 26 so-called new generation ‘leaders’ (including LHL) to take over the Government. • Toiling with the idea of polygamy – “And the way the old society did it was by polygamy. The successful, whether you’re a scholar, a Mandarin or a successful businessman or successful farmer, you had more than one wife. In fact you can have as many as your economic status entitles you or can persuade people to give their daughters up to you. DUM FATA SINUNT, VIVITE LAETI: Beloved Mr Lee? 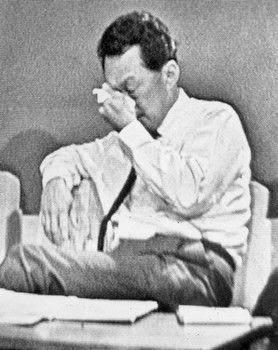 An emotional Prime Minister Lee Kuan Yew during the press conference in 1965 to announce Singapore's separation from Malaysia. A look back at the life and times of Singapore's founding Prime Minister Lee Kuan Yew. Some criticize him as being a dictator, who trampled human rights and smashed his competition to get his way. Some people think he is the savior of Singapore and kept Singapore from remaining a third-world city-state riddled with poverty. I think he is the funniest Asian man to ever have lived on planet earth. During the past fortnight, many accolades were heaped on the late Mr Lee Kuan Yew, Singapore's first prime minister, who died on 23 March. 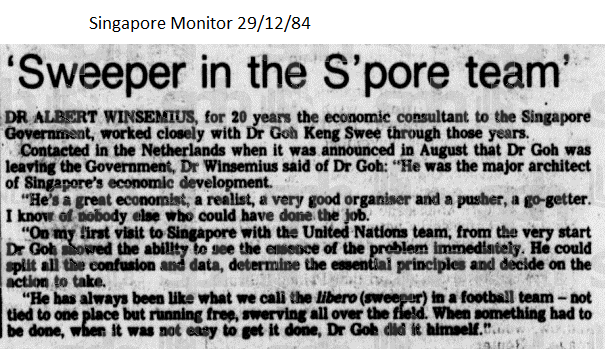 Many of the accolades ignored the contributions of others who contributed to the Singapore success story. Who were some of these people? Mr Lee's fellow cabinet ministers in the 1960s and 1970s such as Dr Goh Keng Swee, Dr Toh Chin Chye, Mr Sinnathamby Rajaratnam, Mr Hon Sui Sen and Mr Lim Kim San. "I'm not a one-man show. You see my picture everywhere; it make it easier for you to symbolise it with one man. Don't believe it is a one-man show. It cannot be done." 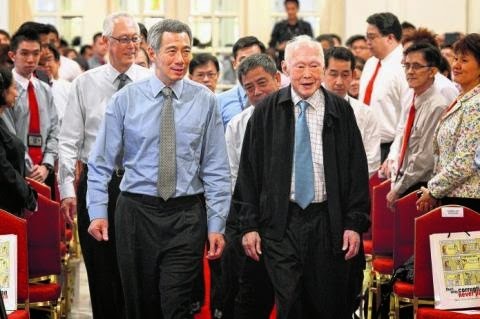 The famiLEE feud: PM Lee "I'm not sure that it is solved"
The famiLEE feud: July 3 Parliament session a cover-up & whitewash? The famiLEE feud: Not another minister on the Will again! The famiLEE feud: Will House Debate clear the air? The famiLEE feud: "Past three days"
The famiLEE feud: "Will of Wills"
What has happened to Lee Kuan Yew's values?